If you’re a morning person, you’re in good company in Traverse City. Especially if breakfast is your thing. Here in the “Culinary Capital” of Northern Michigan, the first meal of the day has become a lasting tradition for locals and visitors alike. And for good reason. 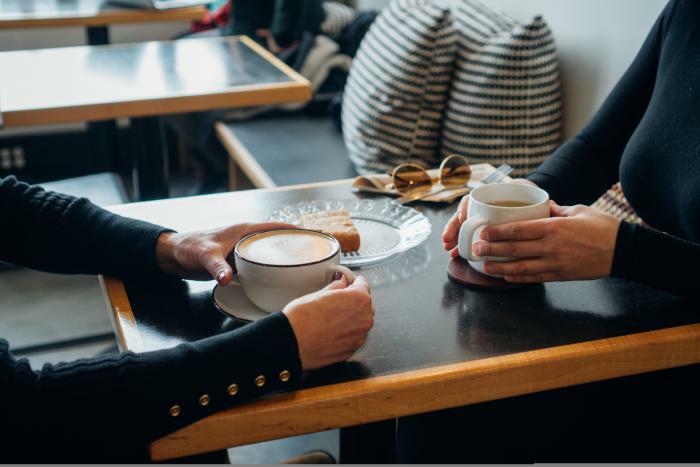 The Grand Traverse area has a full menu of favorite eateries -- from small mom-and-pop restaurants offering homemade, stick-to-your-ribs recipes to hip bistros and café’s offering the latest in fresh, locally inspired cuisine. Looking for the basics (eggs, bacon, etc.)? Check out the Omelette Shoppe downtown or at its Campus Plaza location. Both are near the top of everyone’s must-eat-here list, so don’t be surprised if you’re waiting for a table. But trust us…the wait’s worth it. Known for its signature omelets (of course), the restaurant also serves up hearty and heart healthy dishes, including a wonderful corned beef hash, a real “down home” biscuits & gray, a heart-healthy frittata and -- here’s a twist -- pineapple upside down pancakes…yes, really! 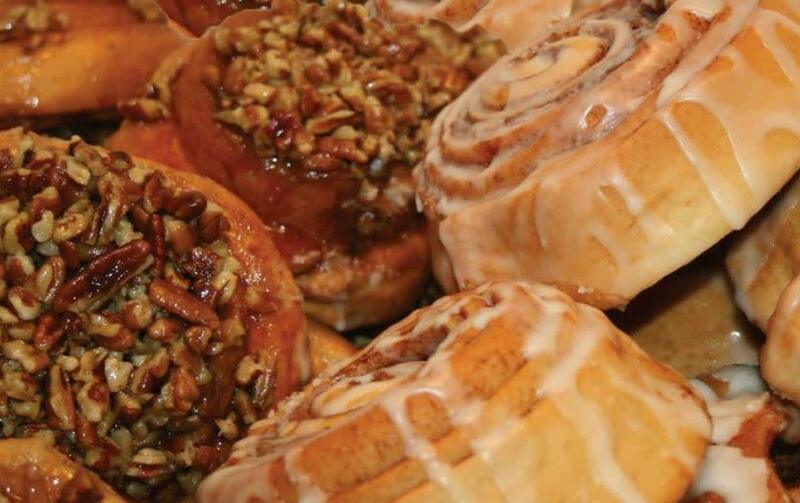 Be sure to save room for one of their signature, oversized cinnamon rolls. Craving something a little more non-traditional? You have lots of options. In Old Towne, tucked among freshly renovated storefronts, is the cozy Blue Heron Café. Grab a booth (there are only a few) and settle in to a breakfast you’ll long remember. The eatery has a rotating menu, based on seasonal ingredients, and their commitment to a farm-to-table experience. Not to worry…everything is amazing. If available, try their potatoes and chorizo bowl…hearty and delicious. You can’t go wrong with any of their egg dishes either. And be sure to pick up a fresh-baked loaf of bread…they bake their own and the crust alone is worth the visit. Just a few blocks away -- and a world away in a culinary sense -- is The Town Plaza. What some would call “fancy”, is perhaps best described by its fresh take on breakfast classics. For instance, there’s the Tasso Benedict with Tasso ham and Cajun sauce instead of the traditional hollandaise. It’s more bite and better for it. The Smoked Salmon cake --another twist on Eggs Benedict, is also a big favorite. The French Toast, made with cranberry raisin bread, is to die for. A relative newcomer to the breakfast scene is Red Spire Brunch House, in Building 50, at the Village of Grand Traverse Commons. As its name implies, the restaurant specializes in morning fare, and it shows. For you “eggheads”, the asparagus omelet with mushrooms and gruyere cheese is a must try. Have an early morning sweet tooth? 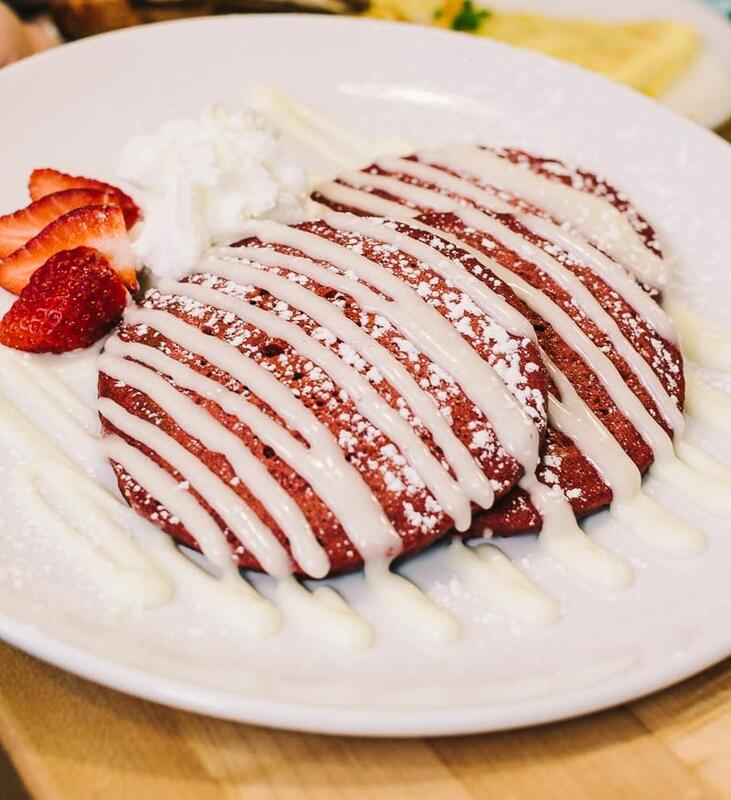 Dig in to a stack of fluffy, Red Velvet pancakes with cream cheese topping. Or just keep it simple and order the classic bacon and eggs…it’s all good, really. Breakfast in Traverse City…there are so many ways to start your day off right here. And the coffee’s always strong and hot.